This narrow lot contained an original post-war single storey, 2 bedroom home that required a full refurbishment. The owners decided to preserve the original external character of the home while creating stylish modern, open plan living spaces within. The original home was raised, allowing for a second level to be built underneath. The lower level was cut into the sloping block so that the rear entertaining area flows directly out to the yard and landscaped pool area. Reyform provided design and consultancy for this project, working alongside local building contractors to deliver this charming Queensland home. 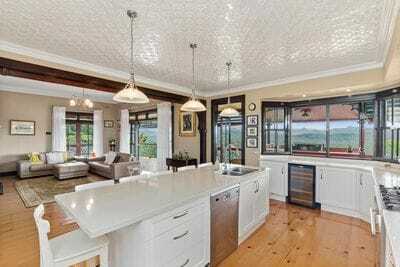 The owners of this federation style house wanted to update and add value to their family home of 30 years in preparation for sale. The key focus of the design was to showcase the spectacular 180 degree hillside views and to modernise the kitchen and living areas. Reyform worked in close consultation with the owners, replacing a series of small rooms with a grand, spacious open plan kitchen, living and dining space. The number of bedrooms was increased from three to four so that it appealed to a wider range of potential buyers. The house was effectively brought into the 21st century while staying true to the home's federation feel. Reyform also provided landscape design and rejuvenation works to the existing pool area. 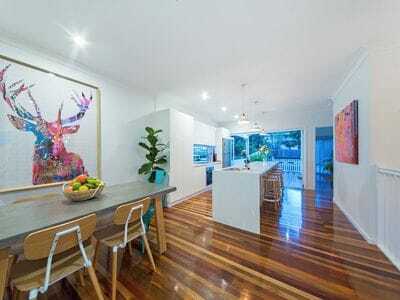 Within months of the completed renovation, the owners sold under the hammer and achieved a record price for their suburb.